From the art of making tires to tire art. What happens to old, worn out tires? About half are recycled. If they’re good enough, i.e., without too much wear, some get a second chance as retreads. Many are processed into fuel, and some still go into landfills. Others become tire swings. Or sandals, or bumpers for boat docks. You’ve seen all these things. 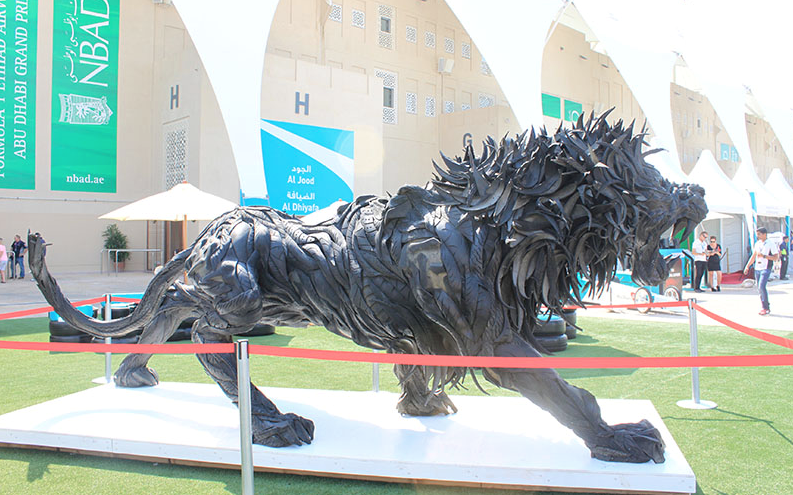 But chances are, you haven’t seen what happens to tires that fall into the hands of Korean sculptor Yong Ho Ji. With remarkable skill, Yong brings old tires back to life as mythical creatures, snarling beasts and wild animals bursting with strength and energy. At Alliance Tires America (ATA), we may not be artists, (craftsmen maybe,) but we can state without a doubt that every tire we make is a work of art—perfectly designed and created to tackle every challenge, every day. Whether it's on the farm, in the forest, or on the job site, Alliance, Galaxy, and Primex tires are a beautiful sight to behold. You can see more of Yong Ho Ji’s work at http://yonghoji.com/db. You can see more of our work at http://www.atgtire.com/.